The ninth BRICS (Brazil, Russia, India, China, South Africa) leadership summit was hosted by China in its coastal city of Xiamen in Fujian province. This summit had the theme of Globalization in the Time of Transition: Shared Opportunities, Challenges and Responsibilities for BRICS. All five heads of state or government, including Indian Prime Minister Narendra Modi attended the summit. The BRICS members states are the world's largest developing countries that have 40 percent of the world population and nearly 30 percent share of the global GDP. Their developmental concerns are common and addressing those concerns through shared understanding and learning from each other is what brings and holds BRICS together. It is important to note that BRICS is the outcome of fourth wave of globalisation in modern times and benefits from it. The general BRICS agenda is about establishing a fair and just global developmental order that is inclusive and gives voice to the concerns and demands of large developing countries. The present trend of deglobalisation and anti-globalisation is against the developmental interests of the BRICS nations. The disruptive impacts of deglobalisation, including trade restriction, visa rule change and abrupt policy changes have cascading impacts. Indian IT industry today stares at staggering job cuts and its cascading impact on the economy and overall consumption can be massive. Therefore, intra-BRICS Cooperation is critical. The areas highlighted by the previous BRICS academic forum can be taken as guidelines for the future intra-BRICS cooperation. These include, Global Governance and BRICS Institutions, New Spaces: Outer space, Internet and Ocean, Trade and Innovation, Development Financing, Climate Change and Energy, Agenda 2030: The Sustainable Development Goals (SDGs). At the informal meeting of BRICS leaders in Hamburg on the sidelines of G20 this year, President Xi Jinping had highlighted that BRICS should "open world economy, safeguard the multilateral trade system, and push forward economic globalization towards openness, inclusiveness, shared benefit, balance and win-win results so that all people can benefit from economic growth and globalization". This highlights the concerns of the BRICS nations. Their joint communiqué said, "Facing uncertainties in the world economy, major economies should enhance macroeconomic policy coordination and avoid negative spillovers to emerging market economies." It also stressed "the importance of upholding a more inclusive, balanced, and open world economy, creating an enabling environment for the development of EMDCs, encouraging human resource development and increasing people-to-people links, so that the benefits of globalization can be shared equally by all countries and peoples." At Xiamen, there was a lot of continuity from what had happened in Goa in the previous summit meeting in 2016. In his inaugural speech, Chinese President Xi Jinping said, "BRICS cooperation has met our common need for development and is in keeping with the trend of history. Though we have different national conditions, we share the commitment to pursuing development and prosperity through partnership. This has enabled us to rise above differences and seek win-win results." He added, "As the world undergoes profound and complex changes, BRICS cooperation has become more important. Our people expect us to jointly boost development and improve their well-being. The international community expects us to make contribution to world peace and common development. We must redouble our efforts to comprehensively deepen BRICS partnership and usher in the second "Golden Decade" of BRICS cooperation." He also said, "We need to stay focused on promoting results-oriented economic cooperation, and expand converging interests in trade and investment, currency and finance, connectivity, sustainable development, innovation and industrial cooperation." During his speech, Prime Minister Modi said that BRICS had developed a robust framework for cooperation and it contributed stability and growth in a world drifting towards uncertainty. He added that trade and economy were the foundations of the cooperation among BRICS. He welcomed the step of creation of a BRICS rating agency to cater to financing needs of sovereign and corporate entities of developing countries. He also highlighted that strong partnership among member nations on innovation and digital economy can help spur growth, promote transparency and support the sustainable development goals. He apprised the BRICS leaders of India's programs in areas of poverty eradication, healthcare, food security, sanitation, energy and education for all and added that the women empowerment programmes were productivity multipliers which brought women in the mainstream of nation development. Modi argued that, "Affordable, reliable & sustainable access to energy is crucial for development of our nations." He urged BRICS nations to work closely on International Solar Alliance. He also said that BRICS members can accelerate track of cooperation in smart cities, urbanization and disaster management. Some of the achievements of BRICS at Xiamen include the formulation the BRICS Trade in Services Cooperation Roadmap, the Outlines for BRICS Investment Facilitation, the BRICS E-Commerce Cooperation Initiative, the BRICS Action Plan for Innovation Cooperation and the Action Plan for Deepening Industrial Cooperation among BRICS Countries. Also, the African Regional Center of the New Development Bank (NDB) has been established for greater regional cooperation within Africa. It was also decided to set up the BRICS Model E-Port Network and the summit reached extensive agreement on taxation, e-commerce, local currency bond, public-private partnership, and the network of financial institutions and services. As such the BRICS practical cooperation has become more institutionalized and substantive, and delivered more tangible results. There was also an agreement to promote people-to-people cooperation and exchanges within BRICS through tourism, sports, film festivals and cultural exchanges. One of the major step forward for the BRICS summit was that the joint declaration named various Pakistan based terrorist organisations like the Haqqani network, Lashkar-e-Taiba, Jaish-e-Mohammad, TTP and Hizb ut-Tahrir, besides the Taliban and the Islamic State. However, this was said in the context of the regional situation and not in the context of concerns of any specific member state. Even then, this is a big step for BRICS as terrorism is a global concern and BRICS position on this issue is a welcome development. The declaration also reaffirmed "solidarity and resolve in the fight against terrorism and agree to strengthen cooperation on this issue. It also called for "(an) expeditious finalization and adoption of the Comprehensive Convention on International Terrorism (CCIT) by the United Nations General Assembly." Many scholars in China, academics and diplomats alike, have been of the opinion that the idea of BRICS plus is important and timely and could become important platform for South-South Cooperation and that other BRICS members should consider it more seriously. At Xiamen, at the BRICS outreach summit, called the Dialogue of the Emerging Markets and Developing Economies, China had invited Egypt, Tajikistan, Mexico, Guinea and Thailand. At the previous summit meetings, outreach initiative dialogue partners were from Eurasian Economic Union (EEU), the Shanghai Cooperation Organisation (SCO), the Bay of Bengal Initiative for Multi-Sectoral Technical and Economic Cooperation (BIMSTEC), the African Union (AU) and the New Partnership for Africa's Development. The choice of outreach invitees is the host country's prerogative. At present India and China are the fastest growing BRICS economies. The other three are somewhat behind with various domestic issues including lack of reforms, political instability, lack of adequate investment in infrastructure and education. China and India can come together and help the other BRICS members come out of the developmental trap for realizing the true potential of BRICS. The next BRICS Summit will be held in South Africa in 2018 and this could be one of the focus areas for that meeting. 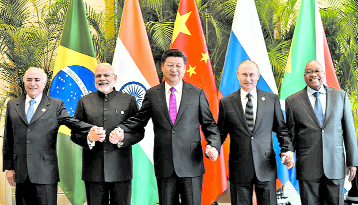 BRICS countries are at a watershed moment today, their development is at a qualitative cusp that can be crossed only with exchanges, cooperation, learning of best practices and dialogue with like-minded countries. As a grouping, this has been the focus and the next decade promises brighter shared future for BRICS as a group and for its member states.